VISIT OUR DENTIST OFFICE IN CARY, NC OFF OF TRYON RD. Our Cary NC Dentist office at Lane & Associates loves to make you smile! Our Cary office is the only location that is now offering Complimentary Spa Amenities with ANY dental procedure! We offer aromatherapy oils such as lavender, eucalyptus or citrus, paraffin hand wax treatment, warm blankets, hot lemon-scented towels, and sounds of tranquility in our Relaxation Room. After getting your spa treatment our office will take you to your dental massage chair to complete the rest of your services! Talk about the royal treatment! Schedule your dental appointment at Lane & Associates Cary Tryon by calling (919)277-7840 today! Schedule your Appointment at Lane & Associates Cary Tryon! Your Cary, NC dentist office off Tryon Rd. is convenient to Cary, Apex and Raleigh, NC neighbors. Conveniently located off of Tryon Road in Cary, NC, our brand new facility offers your entire family all of the dental services you need. From general and restorative dental treatments to cosmetic dentistry procedures, our staff on Tryon Rd. in Cary is committed to providing comprehensive oral care—and as always, At Lane & Associates Family Dentistry, we love to make you smile! Amenities galore: Massage Chairs, Charging and Art Stations, Beverage Stations, and Concierge service! The best thing you can do for your smile is to visit an office that can treat all of your dental needs in one place! We offer a beverage station with coffee and soft drinks in our luxury massage chairs while you wait and the kids can visit the Art Station or charge their devices on our charging stations. 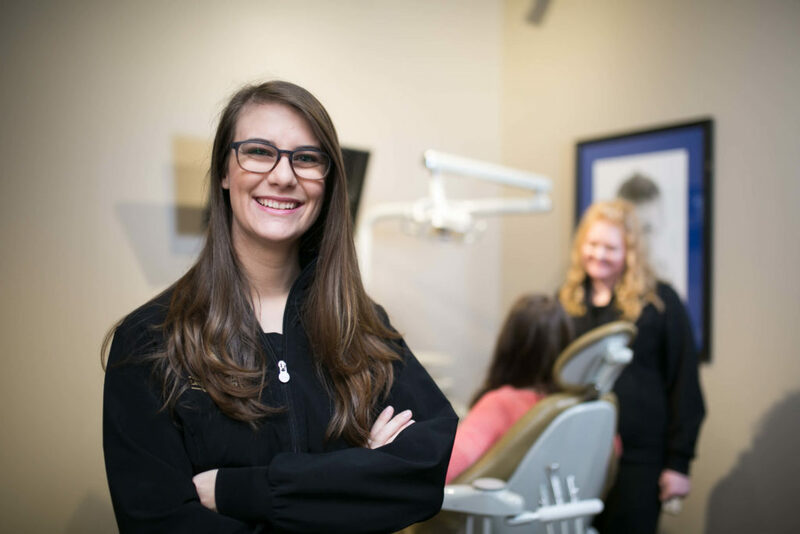 Our Cary Tryon location is also adjoined to NC Oral Surgery + Orthodontics (NCOSO) so your family can visit one location to have all of their dental, orthodontic, and oral surgery needs to be met in a single visit. To request an appointment at our Cary, NC dental office, please fill out our appointment request form below, email us at info@lanedds.com or give us a call at (919)277-7840. We offer flexible appointment scheduling for our busy patients in the Wake County area and our doors are now open! At our Cary Tryon Rd dental office, we accept and file over 18 dental insurance providers. Read more about the insurance providers we are in-network with and accepted payment options here. MORE INFO & DIRECTIONS TO LANE & ASSOCIATES IN CARY, NC OFF OF TRYON RD. 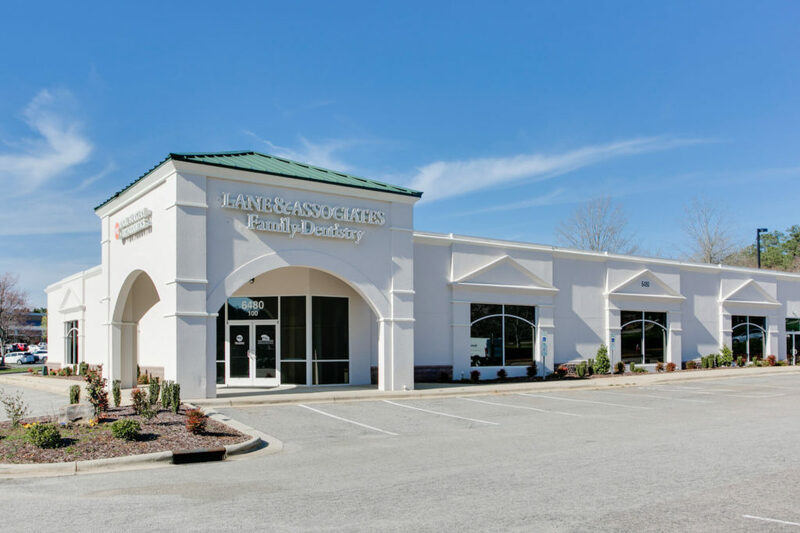 Lane & Associates’ Cary Tryon Rd office is located in the Wellington Park Shopping Center next to Papa Johns and Chanticleer Cafe & Bakery. It is also in the same shopping center as Lowes Foods on Tryon Road, Mr. Mike’s Used Books, and the ABC Store. Our Cary Tryon Rd office is located 1 mile from Waverly Place Shopping Center which includes Whole Foods Market, CineBistro at Waverly Place, O’Charley’s Restaurant & Bar, and WakeMed Cary Hospital. The closest pharmacy is Walgreens Pharmacy located on the corner of Tryon and Kildaire Farm Rd. To visit our Cary, NC dental office off of Tryon Rd. you can always use major landmarks to find us. We are located in the Wellington Shopping Center off of Tryon Rd. next to the Chanticleer Bakery. If you are coming from I-40 West you will get off at Exit 295 for Gorman St., turn left on to Gorman St, turn right on to Tryon Rd. and then your destination will be about 3.5 miles on the right. If you are entering from 1-40 East, take Exit 293 for US 1-East/US-64 West toward Sanford, keep right to continue onto Exit 101A and follow signs for Walnut St/Shopping Centers. Turn right on to Walnut St and then turn right on to Piney Plains Rd and stay on Piney Plains Rd until you reach Tryon Rd. Turn right on to Tryon Rd. then your destination will be on the right. What’s a day at our Cary Tryon dental office like? You may be asking yourself, “What is it like to visit this Cary dental office?” Our modern and stylish dental office prides itself on providing a relaxing and calming experience for our patients in which the location is convenient to nearby shopping malls, nail salons, grocery stores, and even bakeries. The perfect combination! 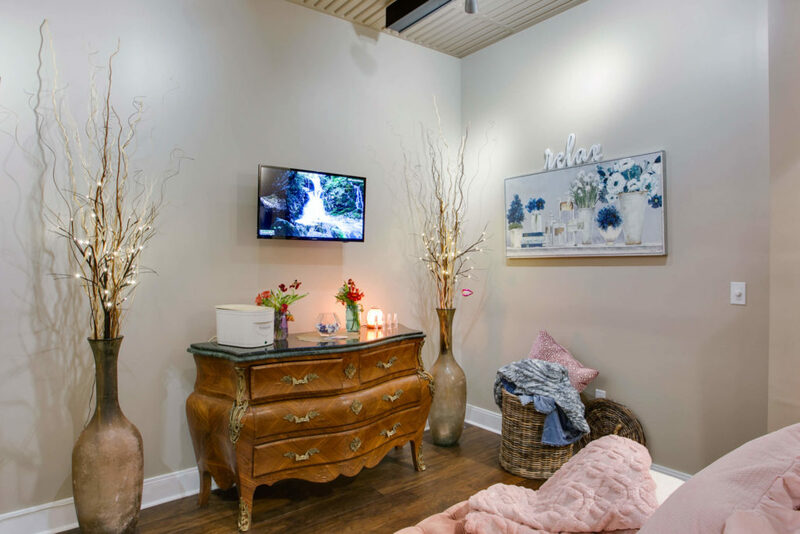 Relax and recharge with us at our luxurious dental office off of Tryon Rd. inside of the Wellington Shopping Center. Enjoy free hot coffee and beverages at one of our three beverage stations. Throughout the year we hold different social media campaigns where you can post a fun picture to Facebook or Instagram tagging us to win special prizes! 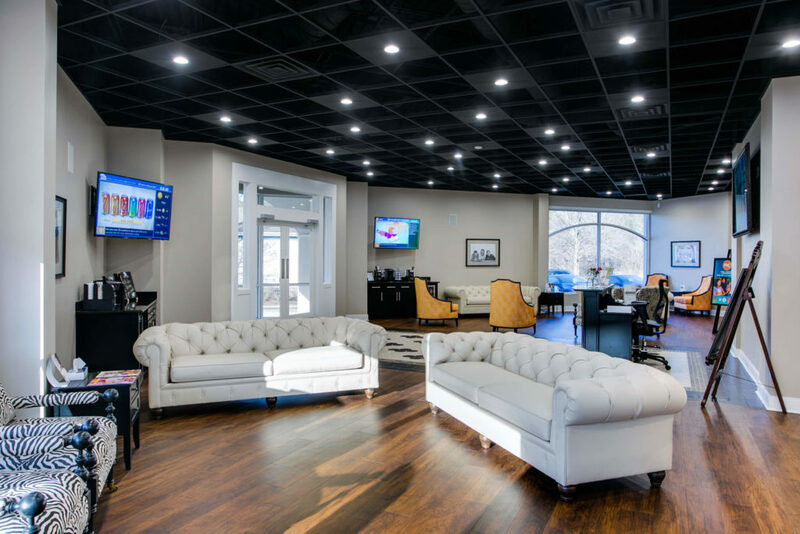 Watch TV in our waiting rooms with channels like HGTV, RachelRay, or ESPN. Charge your devices in our charging chairs or during your child’s orthodontist appointment at our in-house orthodontic company NC Oral Surgery + Orthodontics (NCOSO). The charging cords have capabilities for every variety of device, so you won’t have to worry about losing charge while enjoying our complimentary free WiFi for guests. If your kids love art, this is the place for them! We offer a brand new innovative Art Room where kids can pull down sheets of paper to paint, draw, or stamp a fun new design. We also provide coloring book pages for kids that want to color in a dental drawing for a chance to get their piece of art placed on our Art Wall! 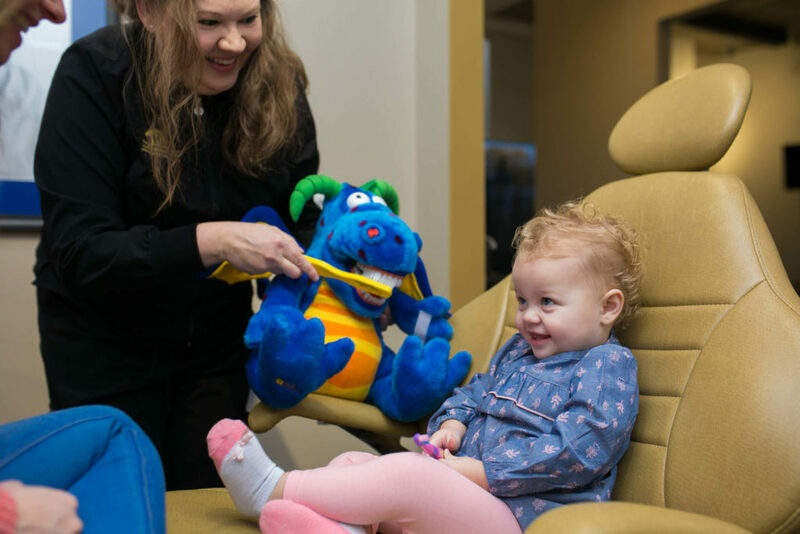 If this is your child’s first dental visit our offices provide a special kit that includes a First Visit t-shirt, a pirate or tooth fairy doll, and a special baby tooth keepsake album. Read more about our First Dental Visit program here. During your appointment, you can ask questions and address concerns about your oral health to one of our highly trained dental team members. Before they begin, try out our dental massage chairs with a personalized remote for added comfort. The dental chairs will adjust based on your preference and our dental team members can always help if you require assistance. After your appointment, be sure to visit the famous Chanticleer Café & Bakery that’s located next door and within walking distance to our Cary Tryon dental office. Their operating hours are from 7 am – 3 pm daily so be sure to request an early-morning appointment. Their menu has a variety of options which include breakfast items, paninis, sandwiches, and a coffee menu. The bakery serves up yummy baked goods and we highly suggest their famous gluten-free chocolate walnut cookie and their toasted berry panini (stuffed with strawberries, Nutella, and marshmallows). Next, enjoy a manicure or pedicure at the New Royal Nail & Spa salon within the same shopping center. There is so much to enjoy by visiting our brand new dentist office in Cary, NC and we can’t wait to share it with you, request an appointment today! Our Child’s First Dental Visit Program allows parents and children a unique opportunity to celebrate their child’s first visit with a first visit kit that includes a keepsake Baby Tooth album that holds their baby teeth and also tells the children which tooth they lost, a First Dental Visit T-shirt to wear home, a Pirate or Tooth Fairy Doll to hold during the first visit, and their picture taken as a wonderful keepsake! Our Department of Sleep Apnea and TMJ at Lane & Associates is dedicated to helping you get a good night’s rest. We offer oral appliance solutions and TMJ Disorder therapy to help you along to the path to relief. Find out more about our services by visiting our Sleep Apnea department page. In addition to Cary at Tryon Rd., Lane & Associates serves dental patients from our locations in Angier, Biscoe, Cary (Green Level West and St. Charles Place), Dunn, Durham (Miami Blvd and Broad St), Erwin, Fayetteville, Fuquay-Varina, Garner, Greensboro, Hamlet, Knightdale, Lillington, Mebane, Mt. Olive, Pittsboro, Raleigh (Ridge Rd, Harvest Oaks, Falls of Neuse Rd, Wake Forest Rd), Roseboro, Sanford (Tiffany Dr and Horner Blvd), Southern Pines, and Winston-Salem. "I am no longer anxious about returning to the dentist!" I was very pleased with my experience at Lane & Associates Family Dentistry (Cary Tryon Rd). I had not been to the dentist in over 4 years and was nervous to go in for a cleaning and check-up. Upon walking in, I was greeted with a smile and was impressed with the amenities offered and the clean, modern waiting area. Throughout my appointment, I felt relaxed and calm. I knew I was in good hands with Melissa and Dr. Howard. I am no longer anxious about returning to the dentist as I was before. I would recommend this location to anyone looking for a dental office that makes them feel comfortable and confident that they are receiving the best care. Meet the skilled family dentists at Lane & Associates in Cary, NC! Our dentists and the rest of our staff offer comprehensive dental care for the entire family. Learn more about each of our doctors below, then fill out the appointment request form on our page or give us a call at (919)277-7840 to request an appointment! Whether it’s time for your routine dental check-up, or you’d like to talk to one of our doctors about our cosmetic dental procedures in Cary, NC, we’d love to hear from you. Request an appointment today using our on-page contact form, or call us at (919)639-2272.